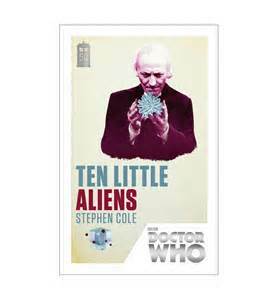 The first of eleven special edition books for the 50th anniversary, this story, written by Stephen Cole features the First Doctor as played by the brilliant William Hartnell who started it all almost fifty-two years ago with his companions Ben and Polly. It starts with the Tardis landing on an asteroid. There the Doctor and his companions find dead aliens who they cannot get to as they are behind some sort of forcefield. It is then they learn that they are locked out of the Tardis for it too has been caught in the field. They decide to investigate and then Polly disappears whilst their attention is diverted elsewhere. Soon they find that they are not alone and that a small group of soldiers are using the asteroid as a combat training area. It is then that they start to disappear one by one and something or someone picks them off. Is there a purpose to it or is it just random killings or abductions? They find out soon enough. I never really read science fiction like this for it does not translate well to me in a book than it does on the screen but I am a huge Doctor Who fan so I had to read these. The last science fiction book that I read was many years ago and another Doctor Who story springs to mind with the Fourth Doctor in the story. I probably read HG Wells too but not much else. I have all eleven of these special editions in the collection and shall read them all in due course as well as other science fiction books past and present. So what did I think of this story? It was difficult to follow at first and I struggled to get into it but soon it flowed and I became engrossed in its labyrinthine plot-line and clever chapter use of Agatha Christie titles and stories. One of the last chapters is very clever in that you do not read it straight but jump back and forth between characters from their point of view so one minute you could be reading page 256 and the next you could be on 221 and then 272. It was a very clever chapter but I did find myself lost at some points when I stopped reading for I was unsure of where I had exactly stopped at so I would be caught in the ‘loop’ for a long while until I found the way out. Concentration is needed. It reminded me of the role-playing fantasy books by Steve Jackson and Ian Livingstone that I loved as a kid. I used to have quite a few of them I seem to remember? I wonder what happened to them? I probably lost them in a move or two? Anyway, it got better and better as it went along and Cole got the characters spot on especially Hartnell’s Doctor who he had down to a tee. It was a good place to start but for me I am looking forwards to book four with the Fourth Doctor as played by the brilliant Tom Baker. I wish to explore the genre more and will probably try Stephen Baxter next unless anyone else out there has any suggestions? All in all I loved it and would recommend it to anyone who likes the genre and Doctor Who.